NPD recently revealed their tablet display shipment estimates for February and March, which show strong gains for the 7" display segment. Interestingly, this surge is not being led by established vendors, but by white-box vendors. This has led to a steep drop in tablet prices & margins, over the past year. Let's take a look at the impact of this dynamic on the Android-iPad platform duopoly. 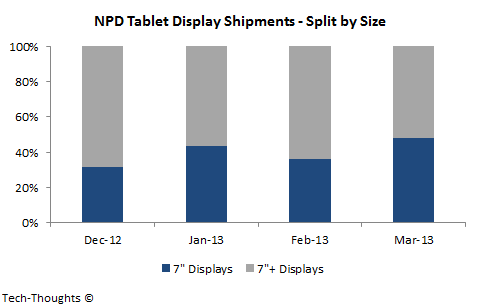 As I've stated before, NPD's research tracks tablet display shipments, which happen to be a leading indicator of tablet shipments (in the absence of an inventory build-up, they would also be leading indicators of tablet sales). 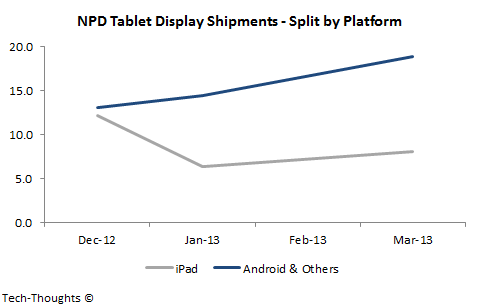 Over the past few months, Android tablet displays have seen huge growth in orders. As we've seen, 7" tablets from white-box vendors have been the primary drivers of this pattern. In comparison, tablet display shipments for branded Android tablets and the iPad (incl. the iPad Mini) are even and have remained flat over the past few months. This clearly shows that the industry is moving rapidly towards commoditization. OEMs are attempting to move upmarket by moving to 8" tablets, but that product category would still remain in the "consumption segment" and would not generate consistently higher margins. 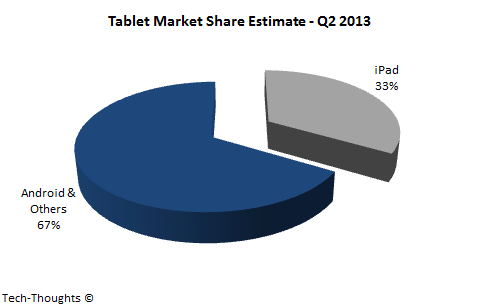 I had previously used tablet display shipments from December & January to come up with an estimate for Q1 2013. This methodology turned out to be quite accurate compared to IDC's Q1 2013 figures. Using the same methodology for Q2 would require tablet display shipment data from March and April. Since April's figures aren't yet available, we'd need to use data from February & March, which could give us somewhat less accurate results. The estimate is roughly consistent with my expectation of a 60+% share of Android tablets in Q2, even if Windows tablets manage to scrape a 3-5% market share. The biggest loser here seems to be the iPad, which has seen flat MoM performance and may see further declines before the iPad Mini refresh.